Contiki Travel is a global tour operator specializing in travel for 18 to 35 year olds. Contiki is now offering two itineraries curated specifically for gay travelers to experience Greece Pride. Greek Week, Athens Pride – (Departing June 9, 2017) Running for 10 days, travelers will explore Athens, Ios and Mykonos. The trip features the Athens Pride festival and a day to explore Gazi – one of the Athens main gay hubs. 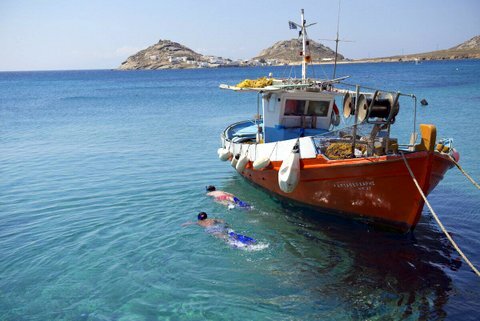 Greek Week, Mykonos Pride – (Departing August 24, 2017) Explores Athens, Ios and Mykonos for nine days over the iconic XLISOR Mykonos festival. We asked Melissa da Silva, president of Contiki, to tell us more. How would you describe Contiki Travel in one sentence? Contiki is the world’s leading provider of once-in-a-lifetime travel experiences for 18-35 year olds. Why does Contiki focus on travel for ages 18 to 35? Contiki was founded in 1962 with a mission to create once-in-a-lifetime experiences for 18-35 year olds. Now, 55 years later, we are experts on what this demographic seeks when they travel and have curated 300 trips to over 50 countries and eight ways to travel, so each traveler can share an adventure that suits their unique style. What is Contiki's NoRegrets philosophy? Live life with no regrets. Contiki embraces everything about being young and aims to change the perspectives of today’s youth through the lens of travel. We believe: life is short, make it count. We aim to inspire young people to live in the moment, make every second count, challenge themselves and step outside their comfort zones. Every Contiki travel experience is passionately created with these philosophies in mind, to ultimately motivate young people to take chances, experience different people, cultures, religions, cuisine and to open their eyes to the exciting and vast world with endless adventures. What can you tell us about your Greek Pride Trips? Contiki has always been an inclusive company and we have travelers of every belief, orientation and background on our trips. Our travelers (as with most Millennials and GenZers) are not only inclusive and accepting, but baffled that some from other generations are not. It is a “given” that all people should be accepted. There was a demand from our travelers to promote specific trips for the LGBTQ and friends community and we thought starting with a Pride trip to an amazingly inclusive country like Greece would be an excellent start. Through these itineraries departing Athens on June 9th and Mykonos on August 24th, not only give travelers the chance to explore the ancient metropolis of Athens, the iconic windmills of Mykonos and experience the party scene of Ios, they will also get an incredible extra – the opportunity to experience Greece Pride. Why is Pride still such an important event? We are a group of open-minded people who embrace everyone’s individuality and believe Pride should be celebrated across the globe. As members of the IGLTA, we believe Contiki is for everyone. Through our Greek Week Pride trips, we’re championing inclusivity and celebrating the LGBTQ community by connecting our travelers to colorful experiences in destinations with strong Pride culture. Contiki Travel is a member of the International Gay and Lesbian Travel Association. They offer inclusive travel opportunities for 18 to 35 year olds.